Moar updates on the steering situation. Most everything is done now :) but there's still some more left. Going ahead and posting this up to try to keep post length down. SO... last we left off I had pulled the CV boots and ordered new axles. Those came in late the next week, so off with the old and on with the new. 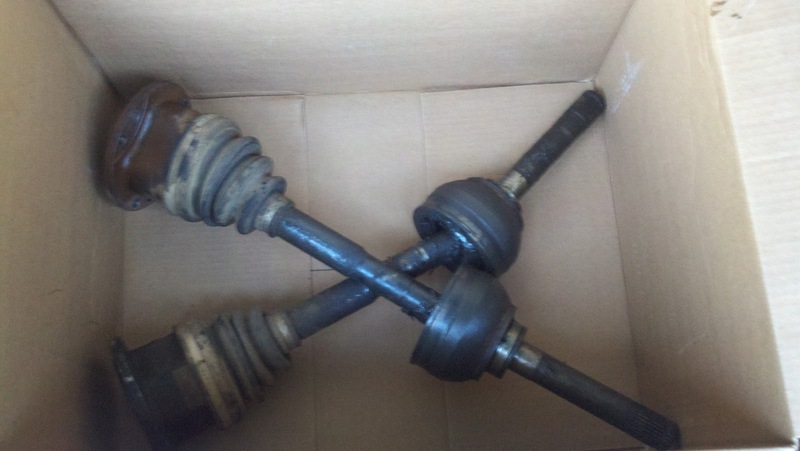 Yanking the axles wasn't too bad. I did have to remove the front shocks though. Basically stripped the front end down to where only the torsion rod and A arms were left. 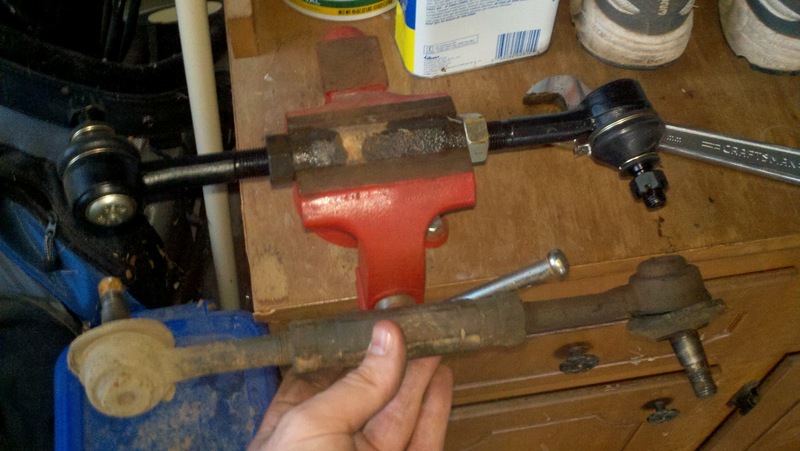 I bought a pipe wrench to use to hold the axles while removing the bolts. Being careful, I managed not to damage the axles any. In about 20 minutes or so both old CVs were free. I boxed the old CVs up thinking that I needed to turn them in to O'Reilleys (I had ordered repro axles) but I ended up getting new ones instead. I haven't heard many good things about the new axles, but this was a different brand and has a 3 year warranty so oh well. A grand struggle was had to get to this point. Picked up the new axles and put them on in the same manner, using the pipe wrench to keep them from moving. Putting them back on took a little longer than removal, but that's pretty normal. 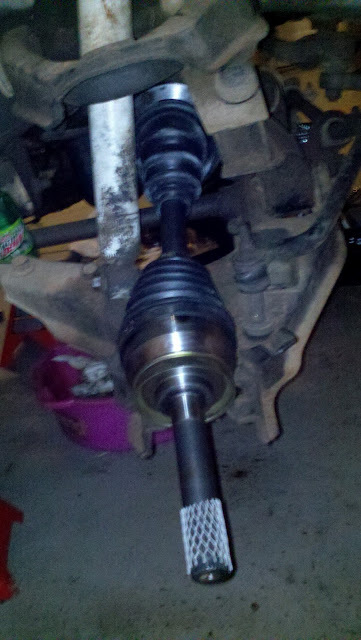 After installing the axles, I had to get those spindles back on. 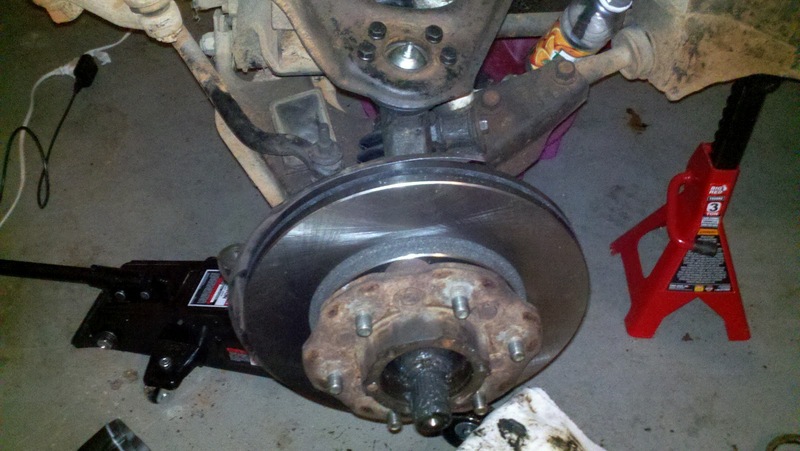 I installed the remaining upper/lower balljoints I hadn't done already. After that I had the incredibly frustrating job of mounting the spindles back in the A arms. I ended up having to jack the A arm up as high as possible without lifting the truck off the jack stands, then use one of those awesome ratchet strap deals to pull the upper and lower together enough to get the bolts in. Before coming to this conclusion, dad and I tried everything in our power to hold the pieces together by hand or by using C clamps. All of those attempts failed miserably. I had completely forgot about buying that ratchet strap deal (I got it on sale over a year ago and never opened it). After getting the strap it took about 45 mins/side to get the spindles installed. 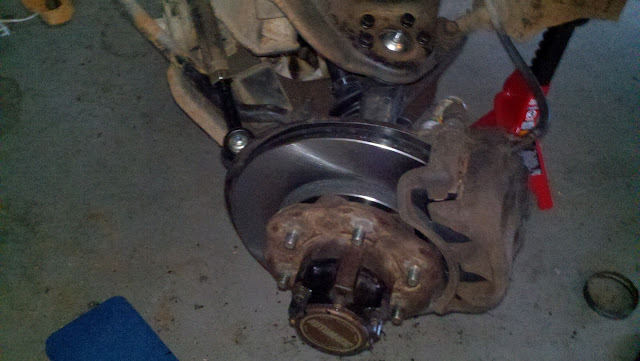 Got those bolts all tightened up, installed the shield thing for the rotor, bearings, and hub/rotor itself. Getting this far took entirely too long. 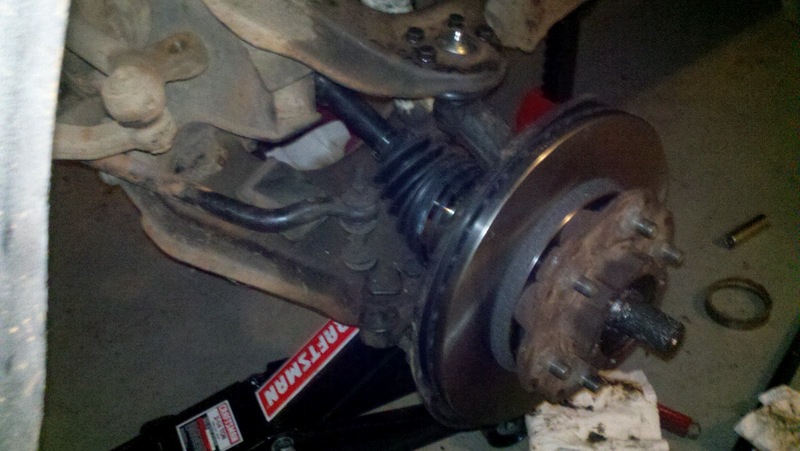 After getting all that crap done, I rebuilt the tie rods and installed those. 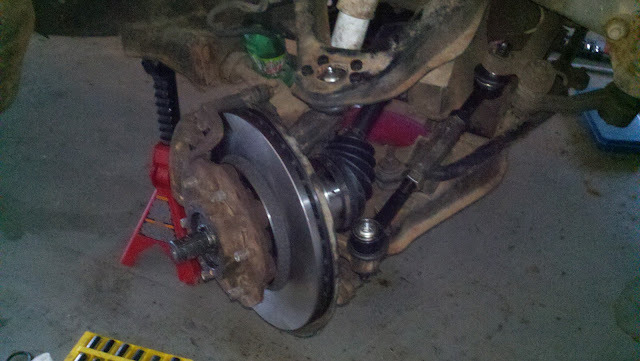 The tie rods weren't too bad, but it did take about an hour to finish them. Getting the old ends off required me jumping up and down on a couple wrenches after soaking them in Liquid Wrench. Installing the new ends was easy enough. New rod ends make that center piece look like a dog turd. 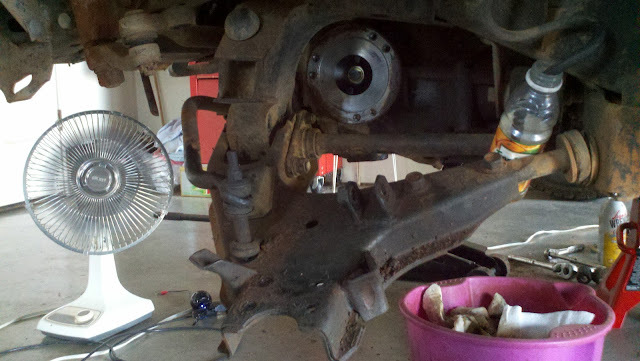 Installed the tie rods, then the 4x4 hubs and calipers. While installing the 4x4 hubs I noticed that the passenger side free running hub brake system was damaged. 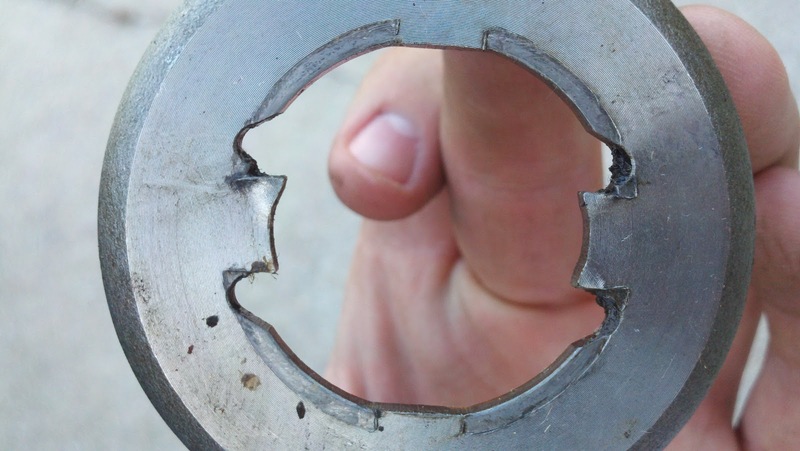 After talking with the guys on Infamous Nissan I decided it would be best to replace this part. I'm currently waiting to get a new one. Hoping to have it next week. So I think this gets the blog up to date. I'm trying to make it more picture heavy and less wordy, please leave feedback on what format you enjoy more. Here's a couple pictures of what she looks like right now. I REALLY want to have the truck drivable next week. 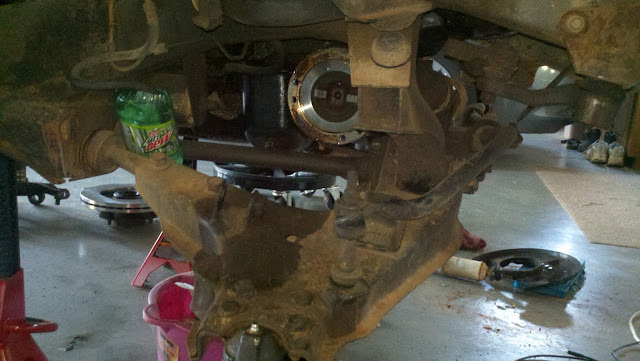 All that's really left to do to get her running after the 4x4 hub is bleeding/refilling the brakes. Hoping my buddy Louis can come over and help with that on Thursday. Once she's working I'll do some of the smaller stuff on the to-do-list post from earlier in the year.